A resplendent vision in BR blue! 1566 is seen at Pentrefelin on Friday 16th June – her first trip into the open after completion of painting in Llangollen shed. Photo (and most of the work!) by Mark Smales. Brush Type 4 powered by 2580hp Sulzer 12LDA28C power unit. Built: Crewe, 1964. D1566 ‘Orion’ (47449 for those who can only remember life after TOPS) is a Crewe-built, series-parallel wired Brush Type 4 (Class 47) – the only remaining Brush Type 4 of this less common pedigree. The loco is fitted with Electric Train Heating (ETH). Her last overhaul was carried out at Crewe in 1986 and Paul Bettany’s photo showing her ex-works can be viewed here. The loco has been a member of the fleet at Llangollen since 1996, following purchase from Pete Waterman. 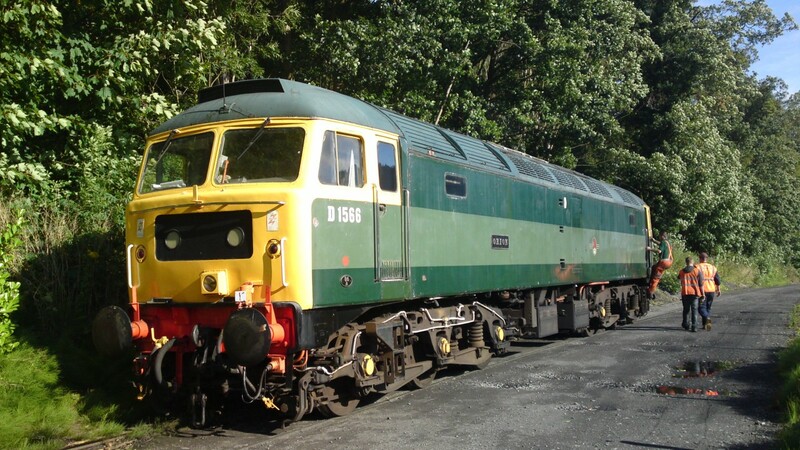 In her mainline days as a British Rail machine she saw allocation to several of the legendary BR Traction Maintenance Depots, many of which are now sadly history. You can find out more about her life pre-2009 on the History page. She carried British railways two-tone green with full yellow ends, retaining as-withdrawn front ends featuring marker lights in place of headcode boxes and fixed-beam halogen headlights. She was named “Orion” by Murray Brown upon re-launch to traffic, a name inspired by her unofficial BR painted-on Tinsley TMD name of “Oribi” (a species of African Deer). 1566 has now reached the end of a 5 year top-end power unit, cooler group and bodywork overhaul. She has been returned to near as-built 1964 external condition, the halogen headlights having been removed and 4-digit headcode boxes re-installed in place of market light panels. One end of the loco had no recessed marker light panel following repairs to collision damage carried out at Crewe works, this was reinstated in December 2015. 1566 undertook a successful public test run to Corwen on May 7th 2017, after being the first member of the class to reach Corwen on April 11th, hauling 6940 for load and insurance. She then went straight into Llangollen shed for further bodywork and a careful repaint into BR Blue. An excellent finish has been achieved and she has been numbered as-TOPs 1566. The Group hope to formally re-launch 1566 to traffic for our Diesel Gala on September 23rd and 24th 2017. A further test run is expected on July 8th. Carl Grocott’s excellent photo of 1566 powering away from Bonwm crossing on her first public passenger train for nearly 5 years on Sunday May 7th. This was the first time a Brush Type 4 has worked west of Carrog on a public train. 6940 was on the rear for insurance, giving a load equivalent to 8 coaches. She is then seen later that day after working straight off her test train and entering the shed for painting. Photo by Mark Smales. After seeing brief use in 2011 and 2012, D1566 was withdrawn from traffic in June 2012 when leaks from the cylinder head transition joints worsened. 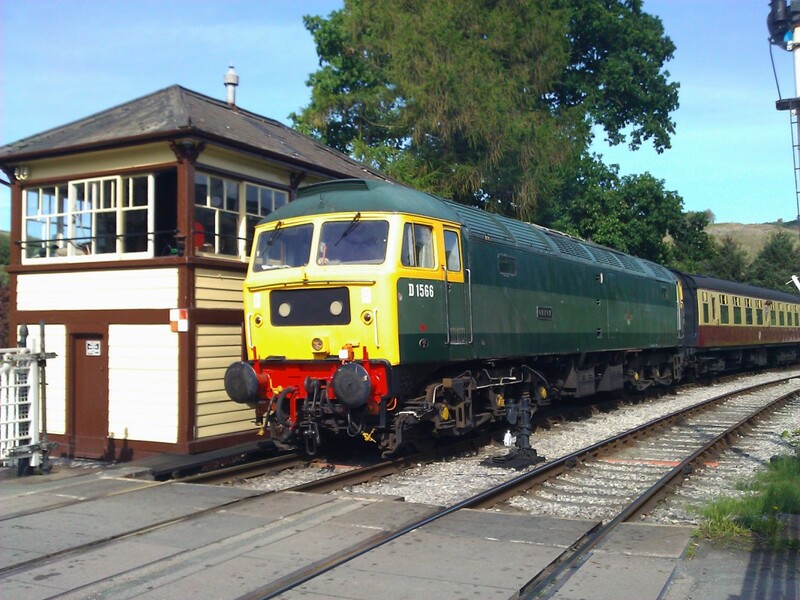 The kindly loaned batteries from HNRC’s 47703 also needed to be returned to the Wensleydale Railway in August 2012 as 47703 was ready to be returned to traffic. After a period stored the loco was moved into Llangollen shed in October 2015, where overhaul work has been progressing steadily. 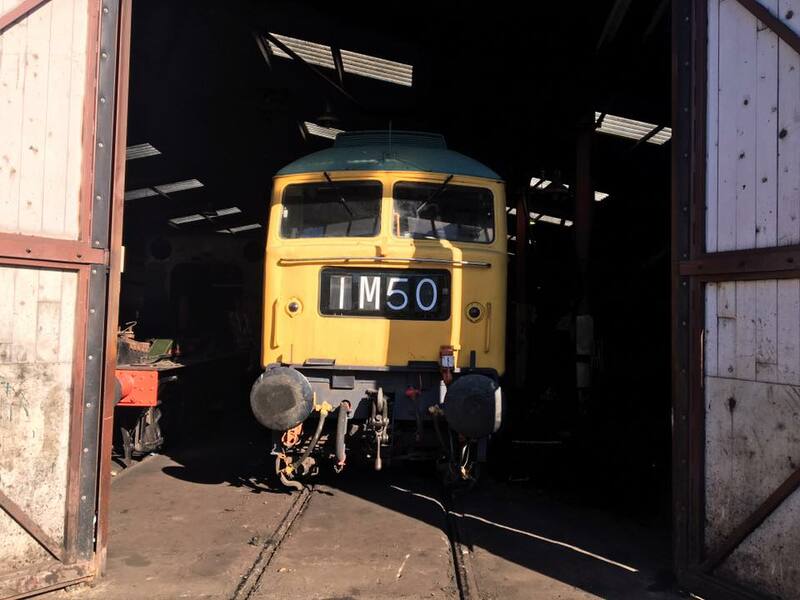 D1566 received a new set of batteries in March 2016, an investment of several thousand pounds and a top end power unit overhaul was completed soon afterwards. Extensive repairs to the roof have been carried out, with attention to corrosion damage involving welding in of much new metal. The was loco successfully started and briefly moved under her own power in September 2016 before the next big task was tackled – extensive repairs to the B side cooler group rail. Until the arrival of Class 26 D5310 from Bo’ness, D1566 was the only operational member of our fleet for most 2009, which was a very difficult and challenging period for the Group. She struggled through the year – suffering from fuel starvation problems after one of the fuel tank changeover valves was mistakenly closed, resulting in sediment from the bottom of the reserve tank contaminating and blocking the fuel filters. Fuel filters were changed, all fuel lines cleaned and the ‘Brush’ then performed well for the second part of the year. Unfortunately the harsh 2009/10 winter caused the steadily worsening corrosion and resulting leaks from the collector box in her cooler group to worsen to the point where it could no longer hold water. The loco then spent the best part of a year in store while Class 37 6940 received cooler group repairs and a bodywork overhaul. In Autumn 2010, attention was turned to assessing the loco to return it to traffic. David Dawson’s photo below shows investigations underway on Sunday 26th September 2010. The radiators and collector boxes were removed at the end of September 2010. A large corrosion hole was found in the radiator manifold and this was repaired. The radiators were found to be in good condition and were refitted with new gaskets. While stopped the Group also attended to some other work required on the locomotive, including replacing the badly corroded main wiring loom conduit in the engine compartment with modern plastic trunking which will not corrode. A diary of the locos 2011 repairs can be seen by using the navigation menu above or clicking here: 2011 overhaul. 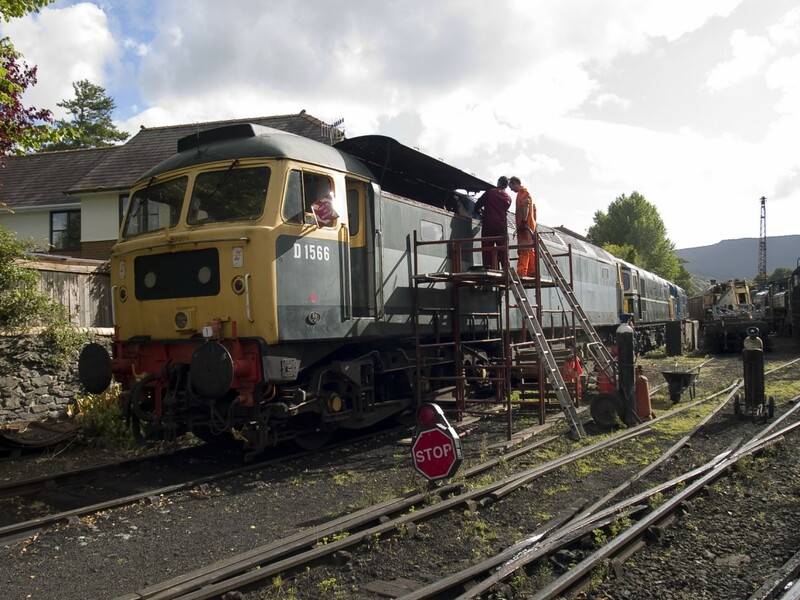 After filling with coolant to check the system for further leaks, the loco was successfully started in June 2011 and, after ironing out some faults, performed a successful test run on the 16:00 Llangollen departure on July 23rd 2011, top and tailed with 6940 as insurance. A resurrected D1566 waits her test run at Pentrefelin on Saturday 23rd July. Photo by Iain Ross. 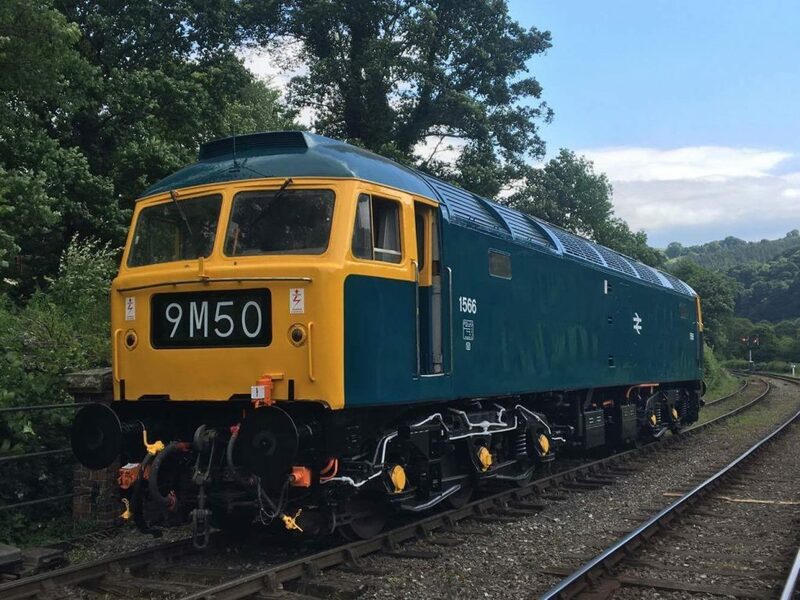 D1566 on the rear of the train she had just worked to Carrog on 23rd July – her first passenger train for nearly 2 years! Photo by David Dawson. The loco was then able to take part in the 2011 1960’s weekend, but unfortunately failed at Berwyn on her second trip on Saturday 30th July 2011 when the power unit shut down and refused to restart. Stripping on the nylon gear in the triple pump (a common problem with this design of pump) was found to be the cause. A replacement gear was fortunately sourced from NRS (they must have gone right to the back of the shelf for that one! D1566’s triple pump was successfully repaired on 29th August 2011. 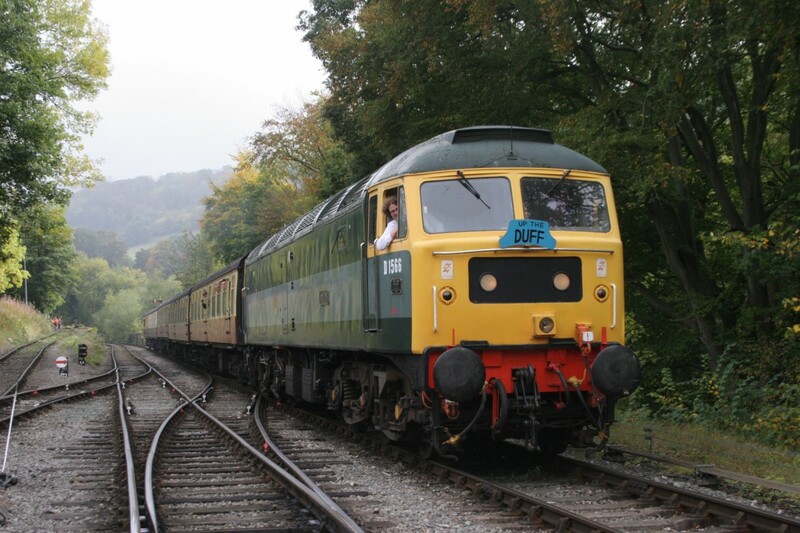 The loco was the able to take part in the 25th September 2011 Autumn Diesel day, performing well. She is seen below at Llangollen Goods Junction carrying Iain Ross’s “Up the Duff” headboard, which usually proves to be somewhat controversial amongst 47 fans! With winter looming again, we were faced with an important decision about the loco. Another Achilles heel were the batteries, which were life-expired and struggling to hold charge. Over the winter of 2011 they failed completely and, with funds not stretching to being able to fund replacements, the Group had to face storing the loco agan. We considered withdrawing the looc at this point for the much-needed top end overhaul pf the power unit to tackle the leaking transition joints and possibly start on the bodywork. 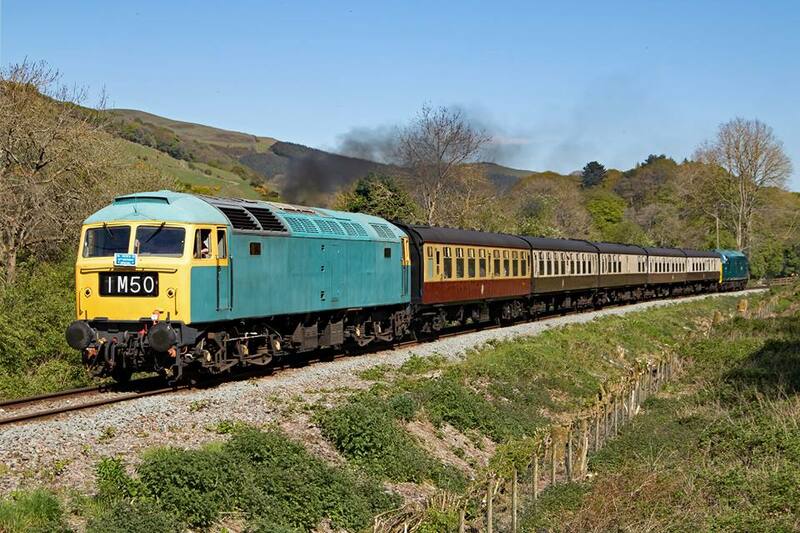 However, Paul Warren at the Wensleydale Railway heard of our plight and, with the kind support of owner HNRC, offered to loan us the batteries from out of traffic 47703 for a season. 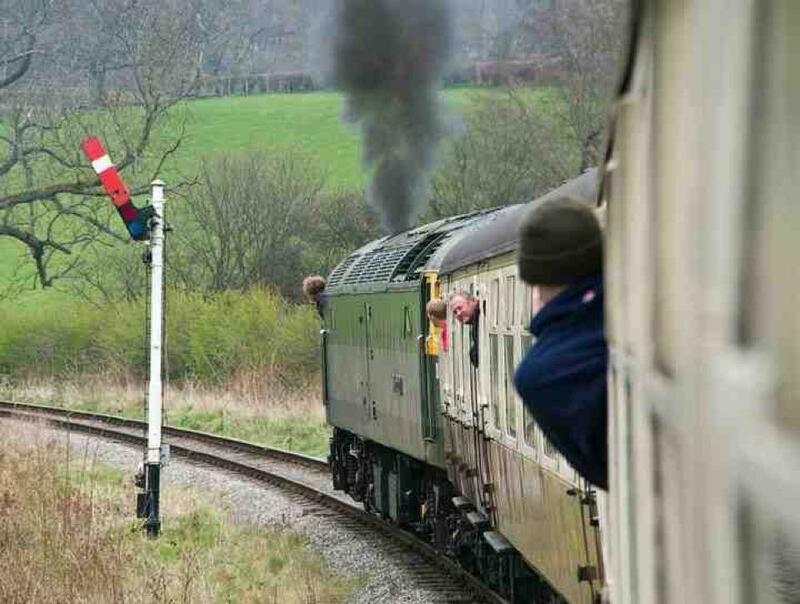 The Group jumped at the chance to get another season’s use out of the loco, collecting the batteries from Leeming Bar in March. They were fitted immediately after arrival at Llangollen and, after a charge, started the loco first try. D1566 was then able to take part in the 24th March 2012 Spring Diesel event, but not before rescuing a failed ballast tamper at work on the Corwen extension on Friday 23rd! The loco again performed well, providing plenty of “Stafford starts” with driver Colin Cooper in the chair. Well why not, he took the dodgy hired van over the Pennines to collect the batts! We had hoped to get more use out of the loco in 2012, but unfortunately D1566 was to see only one further running day on June 30th as leaks from the transition joints worsened and the loco was requiring a water top up on each trip. The difficult decision was taken to withdraw the loco and see it miss the 1960’s weekend. The batteries were needed back for 47703 in August, meaning it would have missed the September 22nd Diesel Day anyway.